Would you like to be on calm while your relative with Alzheimer's disease goes for a walk? 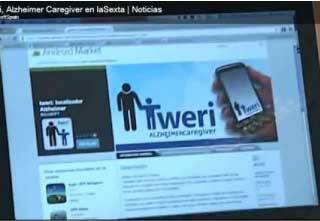 Tweri is a mobile application for iPhone and Android smartphones which has been designed with the collaboration of AFAL Getafe, an spanish association for relatives of people with Alzheimer's disease. In the early stages of the disease, patients with Alzheimer's should be able to live a normal life, although they suffer from occasional memory and orientation loss. Tweri is a free app for iPhone and Android smartphones that allows caregivers to know where the affected person is, in case they go beyond the safety limits or don't come back home at the scheduled time. Tweri provides autonomy and peace of mind... with no costs. Moreover, our technology makes it easy for the solution to evolve.